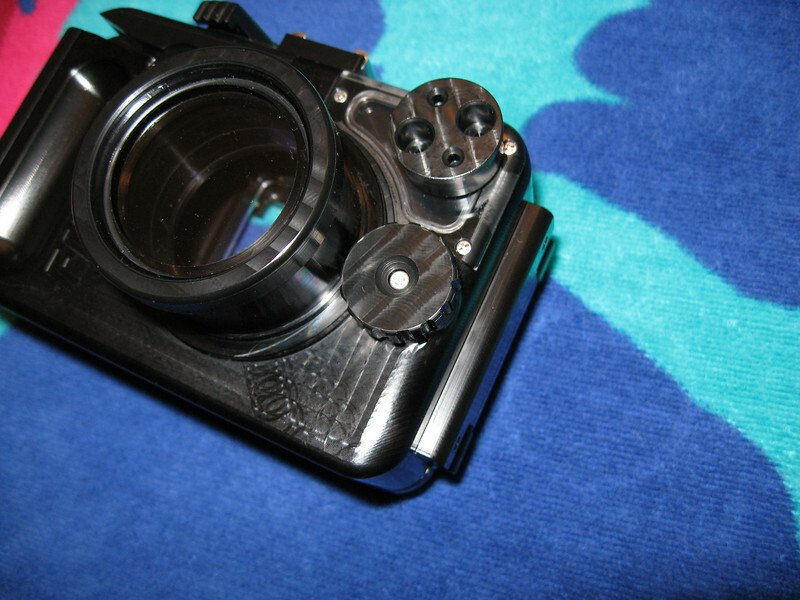 I used the FIX Housing for the Canon S90 underwater. This housing is now sold for the S95 as the Recsea S95 housing. It worked well with the Inon UCL-165AD macro lenses and ok with the INON UFL-165AD fisheye lens. 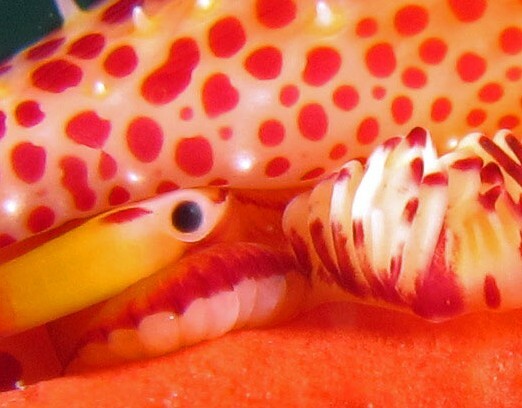 So you can shoot macro and wide-angle on the same dive with wet lenses, this is great! The FIX 28AD mount adapter is needed to use these lenses. The additional $12 28AD->AD adapter ring is not needed, and is not recommended from what we have seen trying it out. UPDATE - James (see his review below) has reported that the UFL-165AD will work much better with the FIX 67mm adapter ($189) + 10bar 67mm to AD adapter ($10). This combination brings the fisheye lens closer to the camera and results in less vignetting than using the FIX 28AD mount adapter. UPDATE - James also feels that the FIX 28AD adapter + Inon UWL-100 28AD lens + dome unit will be an equally good wide-angle lens on this housing. We look forward to trying out this combination. The ergonomics of the housing was great, it was quite easy to change shutter speed and aperture with the dual ring controls. 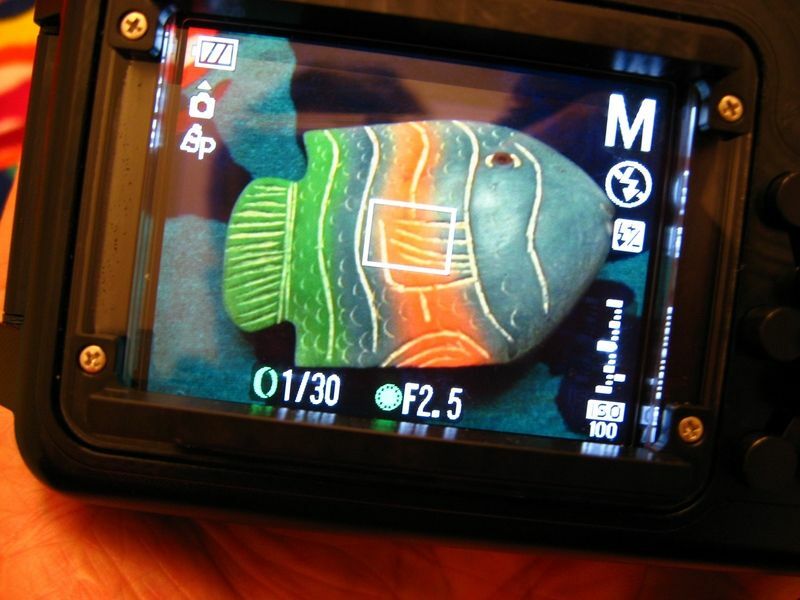 To use the Inon fisheye lens, I had to zoom in 2 clicks, to 35mm. There was still a little vignetting on the right side, that I would normally edit out if possible in photoshop. So it's not a perfect solution, but it works if you already have an Inon fisheye lens, and it's a quick bayonet mount. The FIX fisheye dome port is a 67mm threaded mount, but it doesn't vignette and will most likely give a wider angle of view, I will try to test this option. 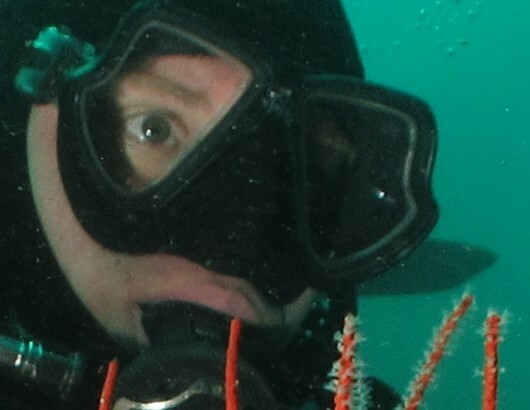 Downside is that threaded mounts are a much bigger pain to use underwater. The supermacro with the Canon S90 and Inon wet lenses looks fantastic! Dyron macro lenses will also give some great results. 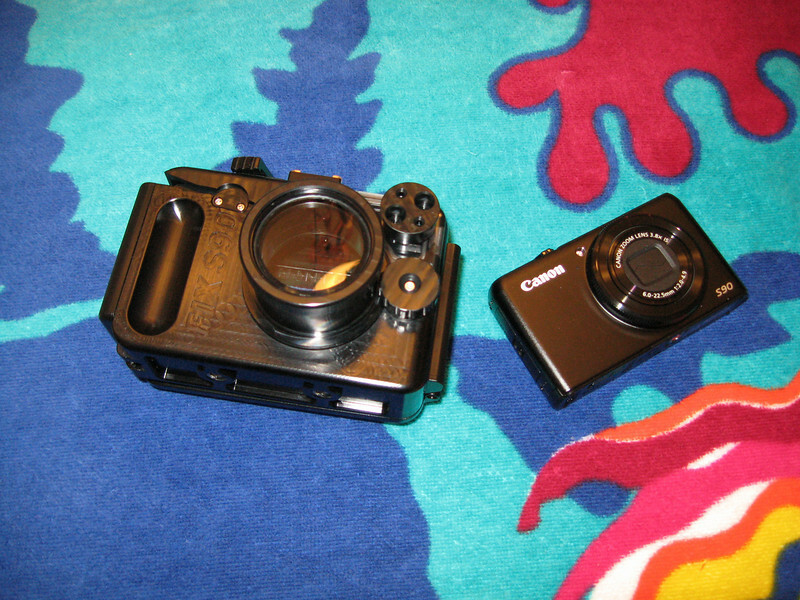 Photo with the Canon S90, Fix housing and the Inon UFL -165 fisheye lens. Blown up, the sharpness actually looks quite good. The only issue is some vignetting on the side. Using the FIX67mm adapter + 10Bar 67mm to AD adapter mostly eliminates this vignetting when zoomed in to 35mm. I had a single strobe on the left, manual power setting. Photo by Scott Gietler at Santa Cruz island, California. F4.5, 1/125th, ISO 100, full manual mode. 100% crop from above photo. Great detail! The FIX90 aluminum housing, like the Canon S90 it is made for, is a marvel of compact engineering and precise fit. The pairing results in possibly one of the smallest housed cameras ever. 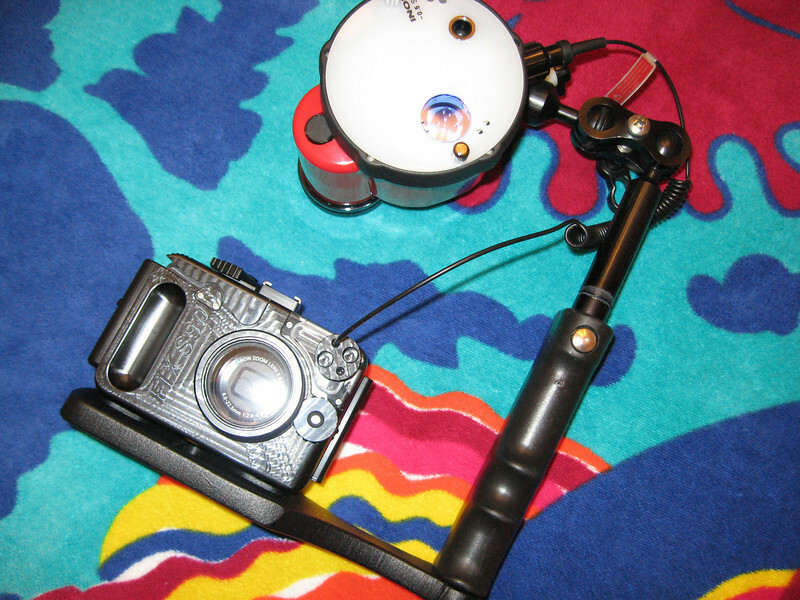 All camera functions are available to the photographer diver. The Canon S90 is a small pocket size pro-sumer camera with a fast f2.0 lens and a 28mm to 105mm zoom lens, RAW and full manual control capability. 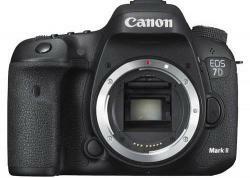 It uses the same sensor and processing engine as the G11. The S90 uses a 10MP sensor which is said to provide greater dynamic range and sensitivity and with less noise, especially apparent at higher ISOs. The Canon S90 camera uses two control rings to access various functions most notably shutter speed and f stop in manual mode. A unique feature for the S90 is the front control ring which can access multiple functions depending upon the camera mode chosen. These are selected by a ring function button on the top of the housing to the right of the power ON/OFF button. Both the ring function and power buttons are easy to access. Unlike other competing housings for the S90, the FIX housing has rotary knobs for both of these camera functions and, yes, this allows direct access to both shutter speed and f stop selection without button pushing or menu searching. These front and rear control rings both operate surprisingly smooth. The rear control rings does slip a little but this is of no real consequence. In fact, it could almost be said that the housing is transparent to the function of the camera. 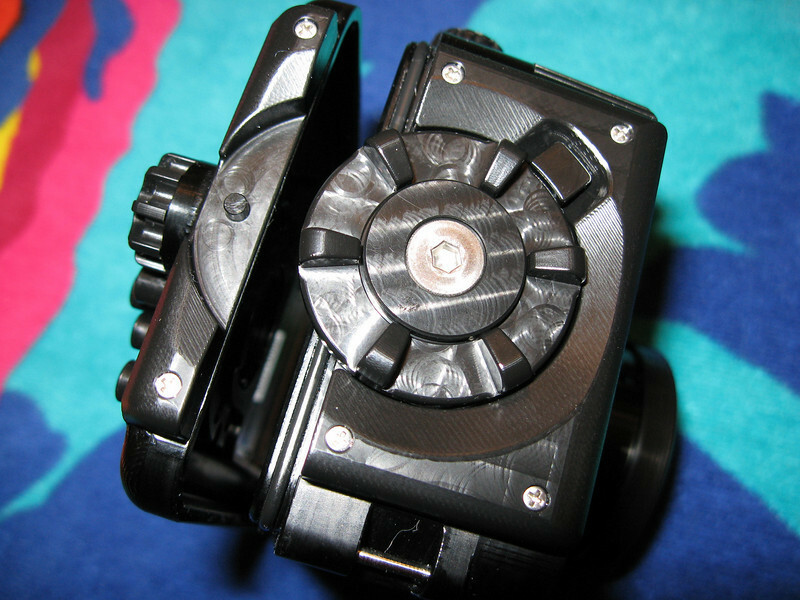 The shutter control is a lever rather than a button and is located on the front right top of the housing. The lever offers tactile feel providing feedback for both full actuation and half press (to lock exposure and focus). Like all small pocket cameras the Canon S90 has multiple small buttons utilized for flash mode, menu selections and up/down left/right menu navigation. These are relatively closely spaced and may give divers with gloves some trouble, the good news is that thanks to the two rotary knobs for the front and rear control rings these are used minimally as the control rings are the primary interface with the camera. 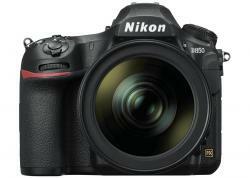 The S90 has a large 3 inch LCD screen displaying the image and all functions including ISO, shutter speed and f stop. The FIX90 housing also has a large view panel that closely matches that of the camera. The accessory rails do slightly interfere with the upper and lower portions of the screen but in practical use this is not of concern. These rails are used for a magnifying hood which allows close focus for macro or close-up photography and manual focus. Perhaps the most impressive thing about the FIX90 housing is its compact size. 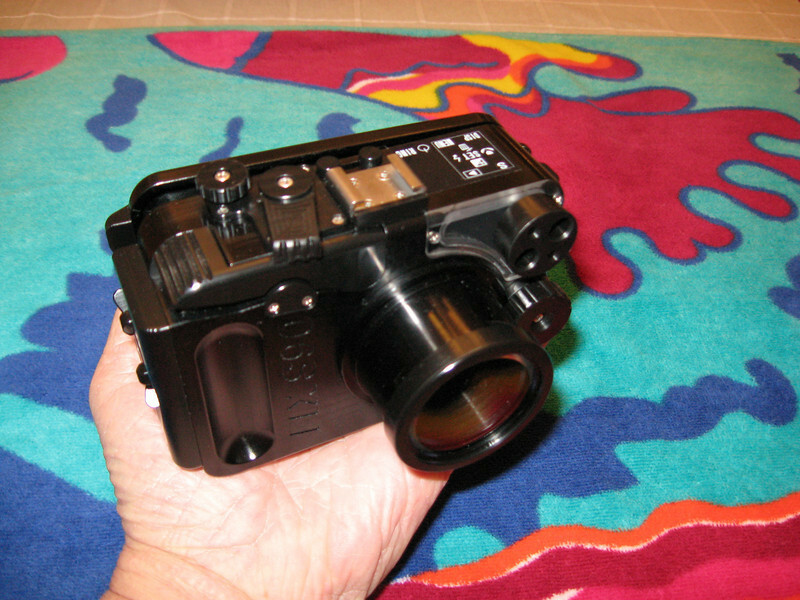 This housing brings back fond memories of the Nikonos cameras. Literally, this new FIX90 housing fits into the palm of your hand. The S90 is a tight fit inside the housing with very little left over room. There is just enough room, fortunately on the left front inner surface for a “Moisture Muncher” or similar desiccant packet. There is no tray or screws to attach to the camera for installation, the camera simply drops in, close the back after inspection of the O-ring and you are done. The locking mechanism is a rotating knob with a button to secure it from accidental opening. 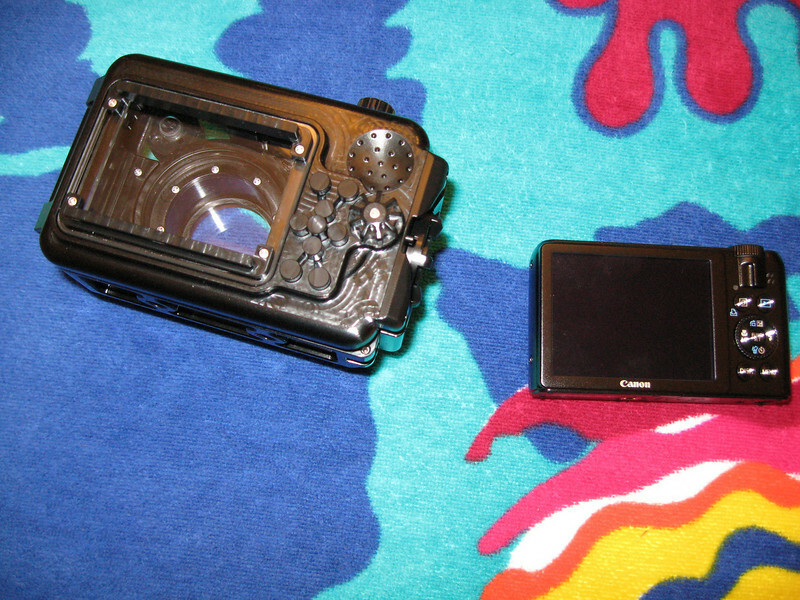 Yes, the FIX90 housing is small, here it compares to a Canon 570 and DC-12 housing, not exactly large itself. This is a pro level aluminum housing that can fit into a BC cargo pocket and there is a sturdy lanyard attach lug for hand use. Of course, many photo divers will use a tray of some description to hold strobes and to ease handling the camera when it has wet mount lenses attached. Yes, indeed, the FIX90 housing is compatible with a variety of commonly available wide angle and macro lenses via several purpose made adapters. There is an adapter for 67mm lenses, Inon 28AD bayonet mounts and Sea Tool/FIX bayonet mount lenses. The FIX90 housing can also utilize purpose made flip down diopters for macro photography. 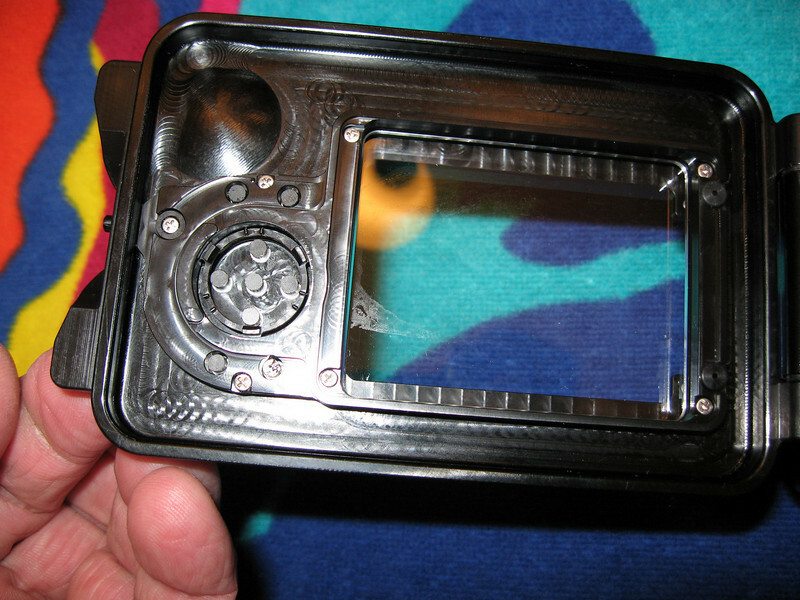 Preliminary reports and testing indicate that wide angle wet lenses will work with this housing. It may be required to zoom in one notch to 35mm to eliminate vignetting. I was concerned that the small size of the housing may present a disadvantage when using wet mountable lenses, some of which can be fairly large and heavy. Certainly a tray with handles will be needed to provide both grip and balance when accessory lenses are mounted and external strobes are utilized. This may seem to defeat the purpose but it is still a very compact package using strobes like the Inon S2000 or D2000, also very compact themselves. Speaking of strobes, the Canon S90 has a built in pop up strobe. 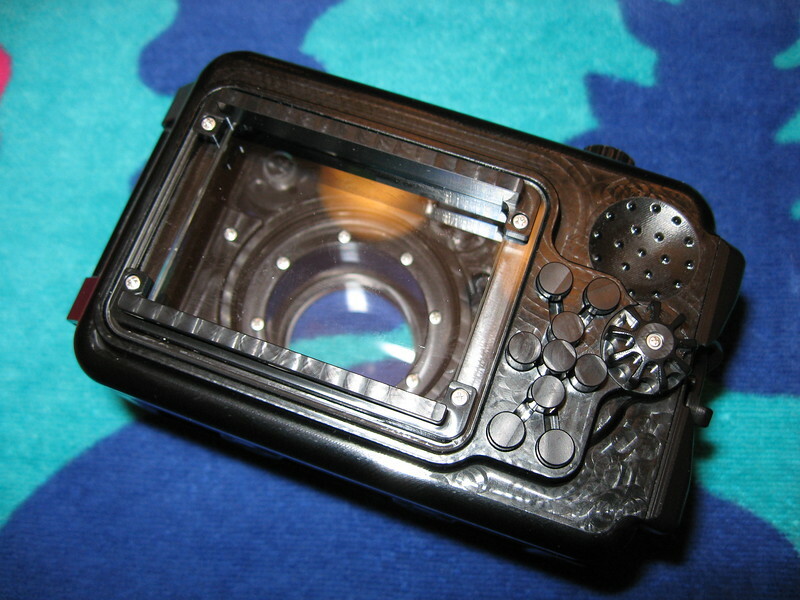 The FIX90 underwater housing has a matching window and the housing also comes with a small half moon shaped diffuser that attaches to the lens port for simple photography using the camera’s built in strobe. 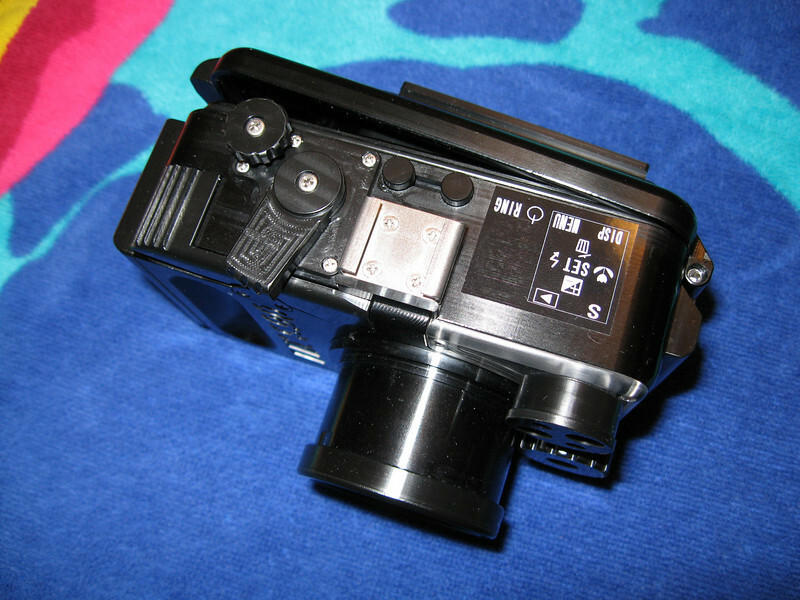 The FIX90 underwater housing is provided with an adapter that threads into the strobe window for attaching optical cables. The optical cable adapter seems intended for YS and Inon optical cables, two large holes and two small for use with one or two strobes. I have not used a YS cable but the Inon cable inserts smoothly with a push and appears to be sufficiently snug that the cable will stay in place, maybe. There is an available strobe window mask that secures under the threaded optical cable adapter to block the internal strobe and prevent backscatter. Well, I guess there is nothing left to do or say but to get this thing wet and see what it can really do underwater. Born in Louisiana, grew up in the deep south and Gulf Coast. I have a M.S. in Geoscience, another in Education, A.S. in Aviation Technology, Airframe and Power Plant rating, Instrument rated pilot. 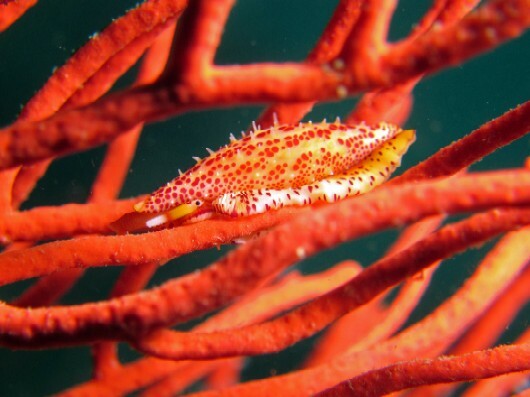 I have been an avid scuba diver since 1966, NAUI certified. I enjoy photography and in particular underwater photography and dearly miss my old Nikonos 35mm. I am a technical instructor and service engineer with a large aviation company. I began my working career as a petroleum geologist with a major oil company, following that I taught high school briefly and then became interested in aviation and aircraft maintenance. My wife and I look forward to the day, not to far away, that we can return to the South and the Gulf Coast. If you enjoyed the article, you can email James. 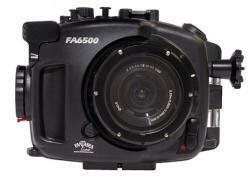 It looks like the FIX UWL-04 fisheye lens and the Inon UFL-165AD fisheye lens with a 28AD adapter both give excellent wide angle results underwater. 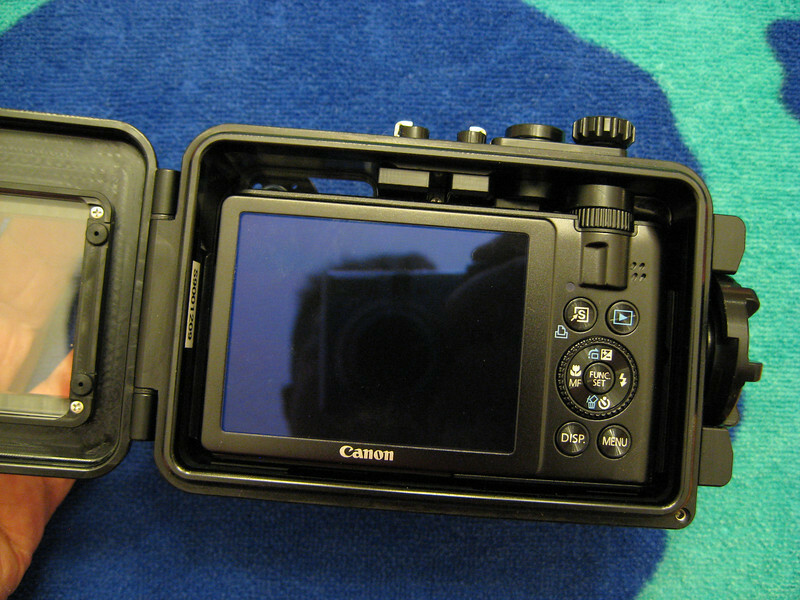 The following link is with the Canon S90 and Fix housing, and it is on the FIX japanese website. I consider the differences in the photos to be minor and results from both wet lenses look good. I'm pretty sure the UFL-165 tests are done with the lens zoomed into 50mm. With the FIX67mm adapter + 10bar 67mm to AD adapter, you only zoom in to 35mm and get a much wider angle of view. Submitted by Simon (not verified) on Fri, 2010-05-14 10:09. I've been looking for the 10bar 67mm to AD adapter ($10) you refer to but have been unable to find it. Do you know any online retailers who sell it? Submitted by scottg on Fri, 2010-05-14 15:14. Submitted by Aussie_dave on Thu, 2010-04-22 18:29. Thanks for doing all this research! Helps to avoid buying incompatible pieces. Q1: Would the FIX UWL-04 fisheye lens (ST mount) attach to the [FIX67mm adapter + 10bar 67mm to AD adapter] combo for wide-angle instead of using the Inon UFL-165AD? Q2: To then covert to macro (using the Inon UCL-165AD macro lens), would you recommend using the 28AD macro lens, or removing the 10bar adapter, and mounting a 67mm macro lens? Submitted by Anonymous (not verified) on Wed, 2010-03-17 13:30. Thank you for the great review and UWP guide! On your WL page - http://www.uwphotographyguide.com/underwater-wet-lenses you write: "This lens only works with housings with an AD bayonet mount, hence the lens is called the UFL-165 AD fisheye lens. It does not work with the 28AD mount base." It seem to contradict Scott's 3/16 update. Can you clarify please? Submitted by Anonymous (not verified) on Sun, 2010-03-14 08:18. Submitted by CompuDude (not verified) on Mon, 2010-01-25 17:12. Great review, James! I look forward to filling in additional information about use with add-on lenses, and specific compatibility notes.